Drama bores me. Not the movie or tv kind of drama. I love a good drama on film or in a book. 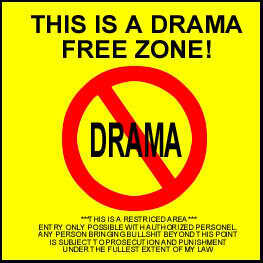 I mean the drama that comes from drama queens/kings. The kind that is mostly made up in someone’s head. They think they are the center of the universe and ‘things’ just happen to them! When in truth it’s either made up, or they add so much to the actual happening that it doesn’t look like it was originally. You know the kind. Yeah, you do. I have a ‘friend’ that does that all the time! He’s so full of himself he thinks everything happens to him because, well I’m not sure why. I’ve caught him in several untruths in the past. So when he comes to me full of drama I question most of it. It becomes boring. I find housework boring. Big YAWN on that one. I’ve done housework most of my life. When I was a kid, me and my siblings had chores to do every day. Now that I am so much older I’m bored with it all! The same old thing day after day after day……. I might get interrupted with boring chores if my vacuum stops working. Or if the dishwasher overflows. Or the cats get in the garbage. See! Even the interruptions are boring! Chit chat bores me. You know the kind. Someone calls you or drops by and wants to just chat your ear off. Usually about nothing. I have things I want to do! But do I become rude? Or just sit dazed, my mind numb with all the useless chit-chat that is filling my brain and making it want to explode! 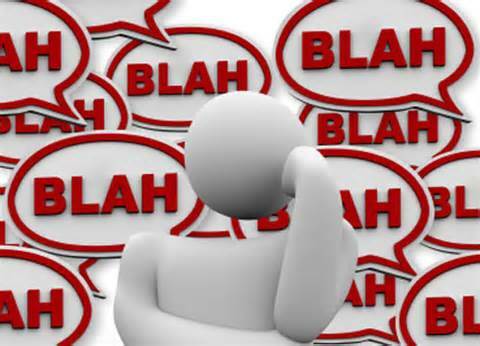 I really try not to be rude but I have learned that with some people you just have to be to shut them up! I don’t think it registers with them that you are being rude because they come back next week and do the same thing! I don’t get bored much myself. I have too much to do. I write, read, paint and yes sometimes do housework. I don’t have time usually to get bored. I can always find something to entertain myself with. But, yes, sometimes I get bored too. Do I consider myself a boring person? No, but then who really does? I might be boring as hell, I’m a poor one to judge myself. I hope I’m not but I might just well be. Oh yawn!! Trying to figure myself out is boring. 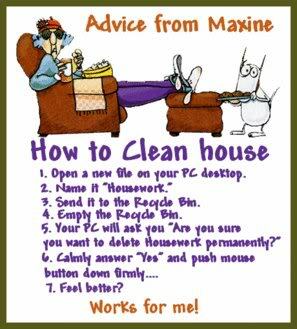 Love Maxine and she’s right about deleting housework. I do so much less of it than ever. I’ll clean before company and enough to be healthy. I’m never bored either and try not to be boring by being a good listener. The drama queens and kings, Like you, I go the other way. If they don’t want to stop, I let them know that i don’t want to hear it. That can be hard to do but I’m getting better at it. It’s a learning process for people pleasers. 🙂 Great post. I’m with you on house work!! Drama queens/king are more like annoying to me. I find curious people, explorer for information people, the most interesting, and I’m always searching for interesting ones or funny ones to spend time with. 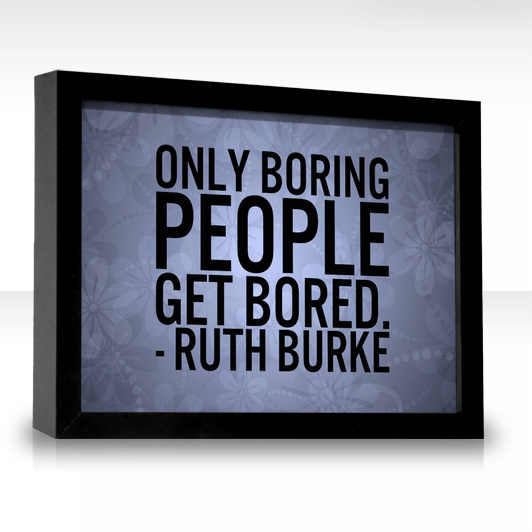 I have no time or patience for the boring ones. Oh yeah, I agree with you 100% Self centered are boring. Course they are kind of drama queens/kings. Everything is about them. Always. I know a few who fit that. Jackie, I am trying to clean out my inbox and just found the link to this post. I don’t know how i missed it. We are seriously too much alike. I can’t stand chit chat for no reason. My ex will call me and want to talk forever (seriously he thinks an hour long phone conversation is a good time), but has nothing to say. Being my ex I can be rude. 🙂 I have a sister who has to be the center of everything and needs the drama, saying goodbye to her was akin to having a huge weight taken off my shoulders. Now being alone, I’m good! I love being alone and can fill each moment of my day with pleasant activities. We most definitely are. 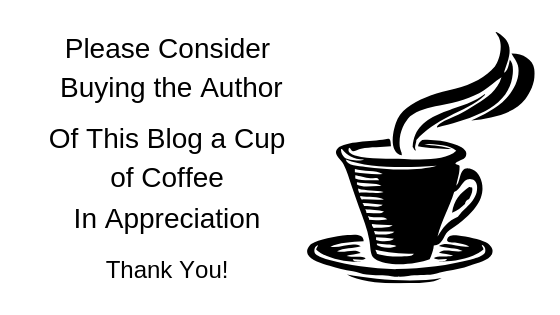 I don’t have time enough to comment on every post I read, but I did plan on commenting on yours as it struck a chord with me.